This article looks at energy density and how you can use it to fine-tune your diet to reach your goals. It makes sense intuitively that bulky food full of water and fibre will help you to feel full, even though they don’t provide a lot of energy. Imagine if all you had to eat were non-starchy, fibrous vegetables like lettuce, broccoli, and celery. You would struggle to get enough energy. Your stomach can only hold so much. However, we gravitate to higher energy density foods to ensure we get the energy we need. We get a dopamine hit from energy-dense foods helps to ensure our survival a species. 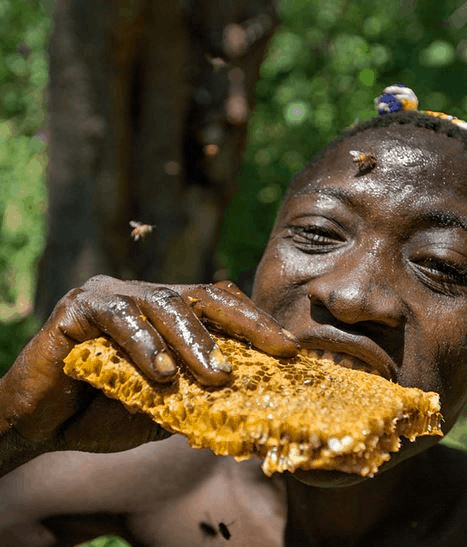 This drove us to hunt down, dig up or fight with bees to get energy-dense foods. However today, in a world of engineered foods, full of refined carbs and added fats, lower energy density foods may be helpful to reverse engineer your food environment if you are trying to lose weight. Who should consider lower energy density foods? Focusing on lower energy density foods only needs to be a priority once you are eating nutrient dense foods and have stabilised your blood sugars. People who are obese and insulin resistant often don’t do well with only celery, broccoli, mushrooms, grapefruit and lettuce to eat. Hunger and appetite often win in the long run. While insulin resistant people often have plenty of stored body fat, their insulin levels are still very high. They may struggle to access their stored body fat and avoid the cravings driven by the blood sugar rollercoaster. A nutrient dense low carb diet with ‘fat to satiety’ can help these people stabilise their blood sugars without hunger. Focusing on more nutritious foods that stabilise blood sugars is enough to help many people lose some weight. However, many find that their weight loss stalls after a while when using a ‘fat to satiety’ approach. Not fearing fat may have helped them start their journey, but ramping up their fat intake to higher and higher levels often doesn’t achieve the desired results. At this point, lower energy density foods and meals can be useful to help take the next step to lose more body fat once your blood sugars are stable and you are in the habit of eating nutritious food. An extreme version of this approach is the Protein Sparing Modified Fast (PSMF) as detailed in Lyle McDonald’s Rapid Fat Loss Handbook and this article. In short, the PSMF is often used by bodybuilders or weight loss clinics to provide the vitamins, minerals, essential fatty acids and protein necessary with the minimum amount of calories to prevent loss of muscle mass and prevent cravings in dieting. If you’re interested in trying out a lower energy density approach, the nutrient dense low energy density foods listed below will provide plenty of nutrients without too much energy. Focusing on these foods will allow you to get all the nutrients you need without too much energy and be able to sustain a long-term energy deficit without excessive cravings. This chart shows how these foods stack up in terms of nutrients compared to the average of all foods in the USDA database. Alternatively, we can use energy density parameter to identify foods with a higher energy density to fuel your athletic endeavours or endurance event without having to resort to energy gels which will provide fast digesting energy but not a lot of nutrition. 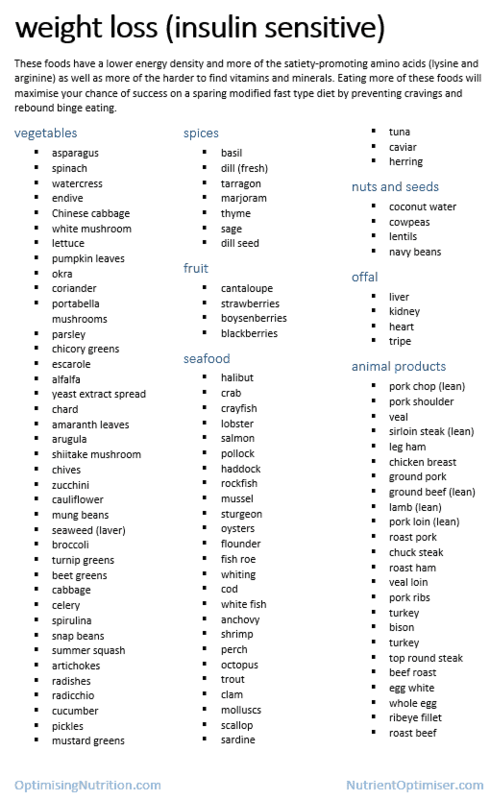 The list of food will provide you with more energy while still being nutrient dense. 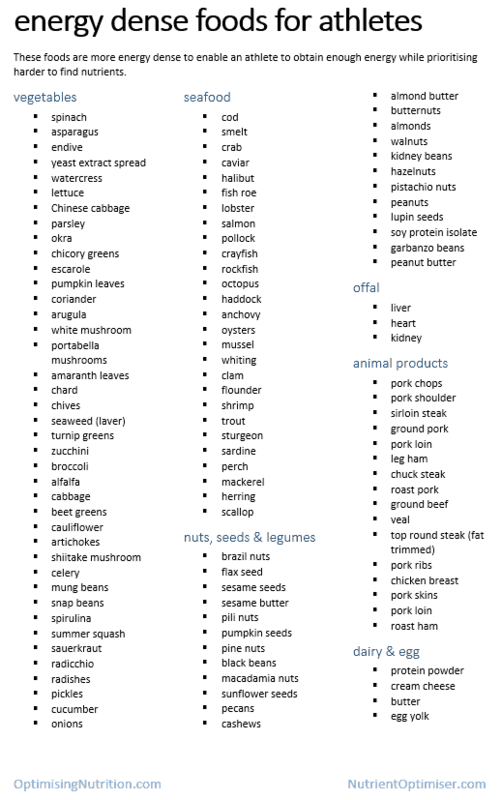 This list contains more nuts, seeds, dairy and fattier cuts of meat. As shown in this chart, these high energy density foods are not as nutrient dense as the lower energy density foods, however, they are still an improvement compared to the average of all of the food in the USDA database. Satiety is complex and involves more than just eating foods that are bulkier. Ensuring your diet contains enough protein (the most satiating macronutrient) and micronutrients (to avoid cravings), along with stabilising swings in your blood sugar (with a lower insulin load diet) are all pieces of the satiety puzzle. 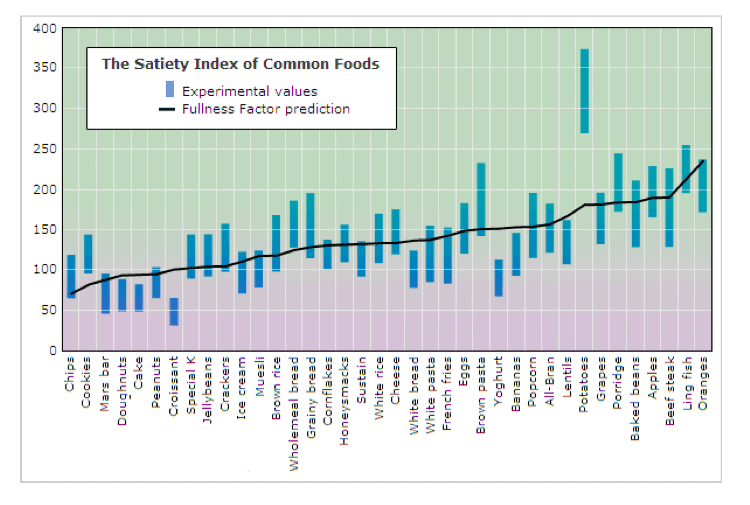 One of the most interesting pieces of research into satiety is a 1995 paper by Susanne Holt and colleagues, “A satiety index of common foods”. This study fed participants 1000 kJ (239 calories) of various foods and looked at how much people ate at a subsequent meal. The study found that how much our stomach stretches is a significant factor in determining how satiating a particular food is. The table below shows the energy density (i.e. calories per 100 g) of a range of foods and their weight per 500 calories. You might be able to eat more at dinner if you had a 40 g of chips for lunch compared to three kilograms of mushrooms or celery even though they both contain the same amount of energy. For those who like to see the numbers, the table below shows the energy density, nutrient density, macros and % insulinogenic of a range of food lists that we can quantify. The list is sorted from the lowest energy density to the highest energy density. The energy density of real food can range from 30 to 450 calories per 100 grams. The lowest and highest energy density foods are not necessarily the most nutrient dense, however, nutrient dense food tends to have a lower energy density. The foods that contain very high levels of fat will be energy dense and not necessarily as nutritious on a calorie for calorie basis. The weight loss approaches have a lower energy density. However, if you are trying to maintain weight or are very active you can still get a fairly nutritious outcome with higher energy approach. When do we use energy density? The table below shows when Nutrient Optimiser uses energy density diet based on your blood glucose levels and waist to height ratio. If you haven’t yet, make sure you head over to the Nutrient Optimiser get your free report complete which includes a list of foods and meals tailored to your goals. Hi there, great piece, do you have the correct link to reference 1.?